Name: Rock & Roll Fun Night! The best event this winter! Enjoy an evening out with family and friends as you take an authentic trip back to the fabulous 1950s! 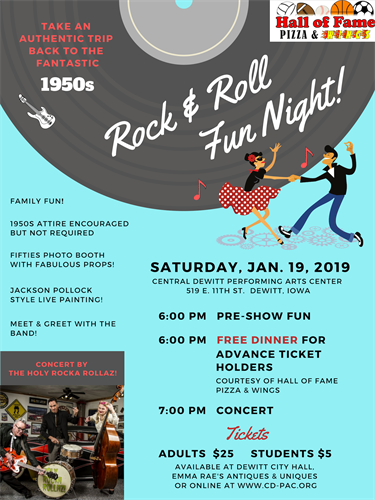 Rock & Roll Fun Night is full of activities and entertainment for all ages. Dress up in your best 1950's attire -- not required but SO FUN! Capture a photo of yourself back in time when you visit the 1950s backdrop with cool props! Step on over to watch local artist, Kimberlyn Aust, demonstrate live painting Jackson-Pollock style! Eat a FREE DINNER (advance ticket holders only) courtesy of Hall of Fame Pizza & Wings! 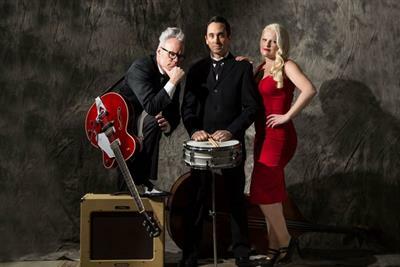 Enjoy a rockin' family-friendly concert by The Holy Rocka Rollaz! Meet and greet the band after the concert! Tickets purchased in advance will include a dinner before the show -- courtesy of Hall of Fame Pizza & Wings.